Not practicing on Wednesday was defensive end Kerry Wynn (concussion). There were no other players listed with injuries. New York Giants running back Saquon Barkley has been named the “NFC Offensive Player of the Week” for his performance against the Tampa Bay Buccaneers last Sunday. In that game, Barkley rushed the ball 27 times for 142 yards and two touchdowns. He also caught two passes for 10 yards and a touchdown. There is no media availability to the Giants on Thursday (Thanksgiving). The Giants practice again on Friday in preparation for Sunday’s away game against the Philadelphia Eagles. Not practicing on Thursday due to injury were tight end Evan Engram (knee), wide receiver Cody Latimer (knee), running back Jonathan Stewart (foot), and nose tackle Damon Harrison (knee). Linebacker Olivier Vernon (high ankle sprain), linebacker Connor Barwin (knee), cornerback Eli Apple (groin), cornerback Antonio Hamilton (groin), and wide receiver Stacy Coley (hamstring) practiced on a limited basis. The Giants practice again on Friday in preparation for Sunday’s home game against the New Orleans Saints. 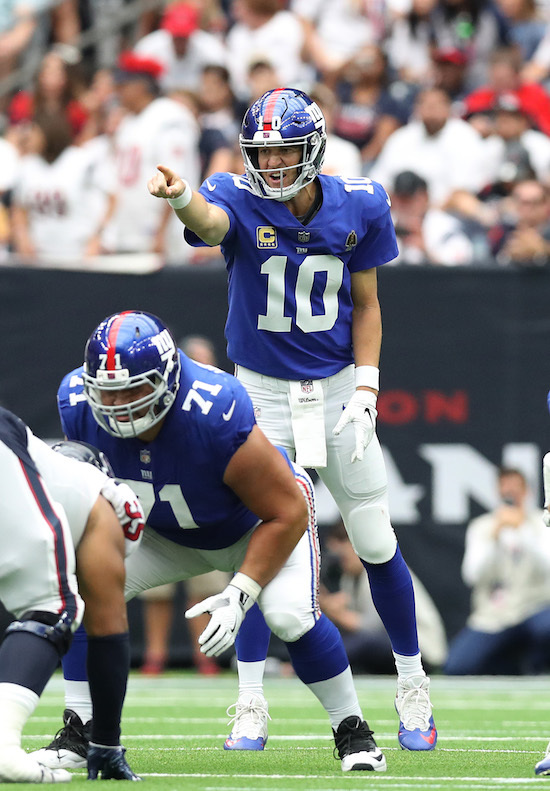 The New York Giants may have saved their season on Sunday with a 27-22 victory over the Houston Texans at NRG Stadium in Houston. It was the team’s first win on the season and the Giants are now 1-2. 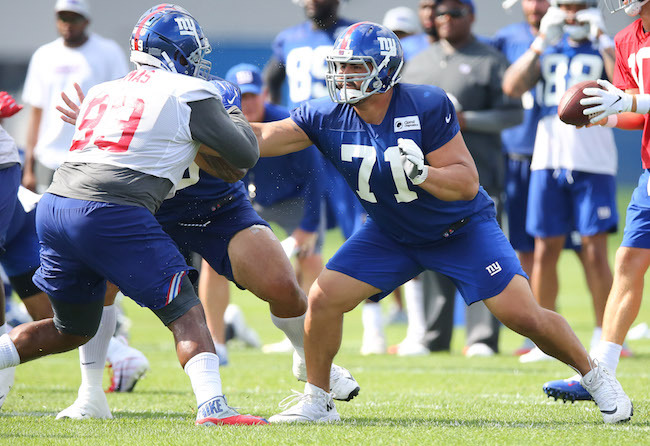 Some drama began before the game was even played as it was revealed that the Giants had benched right tackle Ereck Flowers for Chad Wheeler. The Giants will also have to hold their breath as tight end Evan Engram left the game with a knee injury and he will undergo an MRI on Monday. Statistically, the game was pretty even. The Texans out-gained the Giants in total net yards 427 to 379 and both teams accrued 21 first downs. But the Giants won the turnover battle 2-0 and were 3-of-4 (75 percent) in red zone opportunities. The Giants also held the ball 10 minutes more than the Texans as the Giants out-gained them in rushing yards 114 to 59. The Texans received the ball to start the game. They drove the ball 69 yards in 11 plays to set up a 23-yard field goal. To the defense’s credit, they held Houston to three points after they had set up a 1st-and-goal from the 5-yard line. 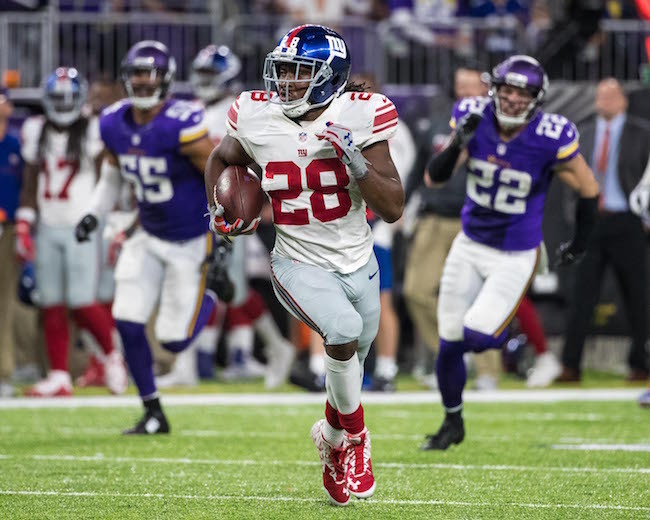 The Giants responded with a 10-play, 75-yard drive that ended with a 15-yard touchdown run by running back Saquon Barkley. Quarterback Eli Manning kept the possession alive with two 3rd-down conversions to his wideouts. The Giants forced a three-and-out on the Texans’ second possession and the Giants added to their lead with a 44-yard field goal by place kicker Aldrick Rosas after a 9-play, 58-yard drive. Giants 10 – Texans 3. The Giants’ defense kept up the pressure on the Texans’ third possession, causing another three-and-out. The Giants then had their third scoring drive in a row by driving 64 yards in 10 plays to set up Rosas from 30 yards out. Big plays on the drive included a 19-yard catch by tight end Evan Engram and a 24-yard run by Saquon Barkley. 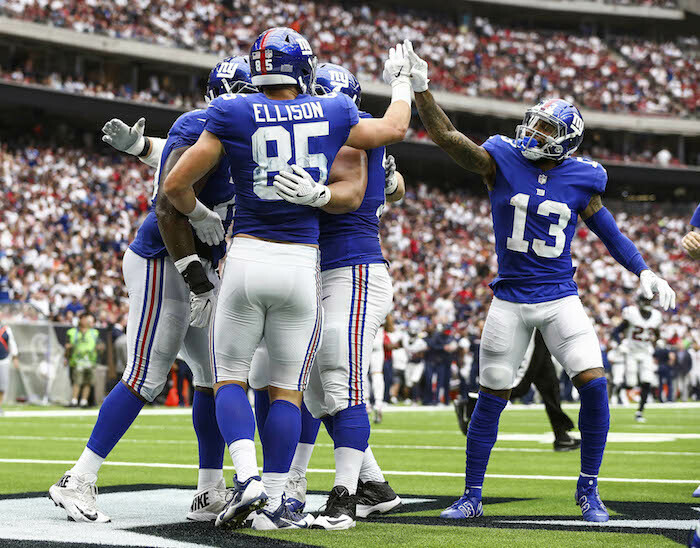 Houston again went three-and-out and the Giants appeared to take firm control of the game with a 6-play, 71-yard drive that included a 17-yard pass to wide receiver Sterling Shepard, a 30-yard pass to wide receiver Odell Beckham, and a 16-yard touchdown pass to tight end Rhett Ellison. Giants 20 – Texans 3 with the Giants scoring on all four of their first-half possessions. The Texans did manage to add three points right before halftime by driving the ball 65 yards in nine plays to set up a 28-yard field goal with no time left on the clock. At the half, the Giants led 20-6. The game got uncomfortably tight in the second half as the Giants’ offense was shut down for most of the rest of the game. The Giants were held to three first downs and 30 yards on their first four drives of the half, all ending with punts. Houston also cut into the lead again on their first possession in the 3rd quarter with a 54-yard field goal. New York’s defense kept the game from getting tighter by forcing two turnovers. Defensive end Kerry Wynn forced a fumble that was recovered by cornerback Donte Deayon at the Giants’ 25-yard line. But Houston drove the ball deep again on their subsequent possession, reaching the Giants’ 8-yard line before a penalty and sack by defensive end B.J. Hill pushed the ball back to the 25-yard line. Then inside linebacker Alex Ogletree made an athletic interception in the end zone, resulting in a touchback. After yet another three-and-out by the Giants, Houston drove 67 yards in seven plays with quarterback Deshaun Watson throwing a 6-yard touchdown pass with under eight minutes to play. The Texans failed on their 2-point conversion and the Giants led 20-15. At this critical moment in the ball game, the New York offense finally came back to life. Manning threw a 23-yard pass to Shepard, a 17-yard pass to Ellison, and a 21-yard pass to Barkley. Three plays later, on 3rd-and-goal, Manning found Shepard over the middle for a 7-yard touchdown. The Giants now led 27-15 with just over two minutes to play. The Texans did make the game appear tighter than it was late by scoring one final touchdown with one second left. Offensively, Manning finished the game 25-of-29 for 297 yards, two touchdowns, and no interceptions for a 132.3 quarterback rating. His top targets were Beckham (9 catches for 109 yards) and Shepard (7 catches for 80 yards and a touchdown). Barkley gained 82 rushing yards and one touchdown on 17 carries and also caught three passes for 35 yards. 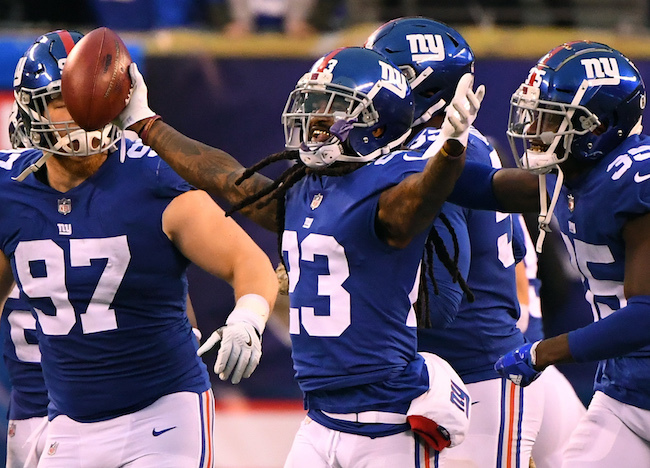 Defensively, the Giants held what had been the League’s #1 rushing attack to 59 yards, with Houston running backs only gaining 23 yards on 14 carries (the other 36 yards were by the quarterback). The Giants also picked up three sacks, one each by Hill, linebacker Lorenzo Carter, and defensive lineman Mario Edwards. Wynn had a strong game with five tackles, a tackle for a loss, a pass defense, and a forced fumble. Inactive for the New York Giants were linebacker Olivier Vernon (ankle), cornerback Eli Apple (groin), wide receiver Kaelin Clay (ankle), quarterback Kyle Lauletta, center Evan Brown, cornerback Michael Jordan, and safety Kamrin Moore. Running back Saquon Barkley (knee) left the game but returned. Cornerback Antonio Hamilton injured his groin in warm-ups. 2017 YEAR IN REVIEW: The tight end position was one of the few bright spots in another wise dreary season for the New York Giants in 2017. 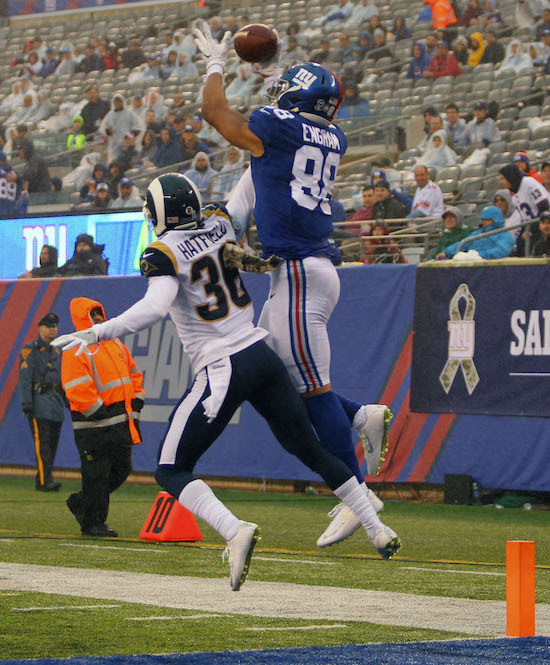 Despite a bad case of the dropsies, rookie tight end Evan Engram led the team with 64 catches for a near team-high 722 yards and a team-high six touchdown receptions. Rhett Ellison may have been overpaid and underutilized, but he was solid contributor as a blocker and receiver. He caught a career-high 24 passes, which made him the 7th-highest receptions leader on the team. Jerell Adams was the third tight end and finished the year with eight catches. 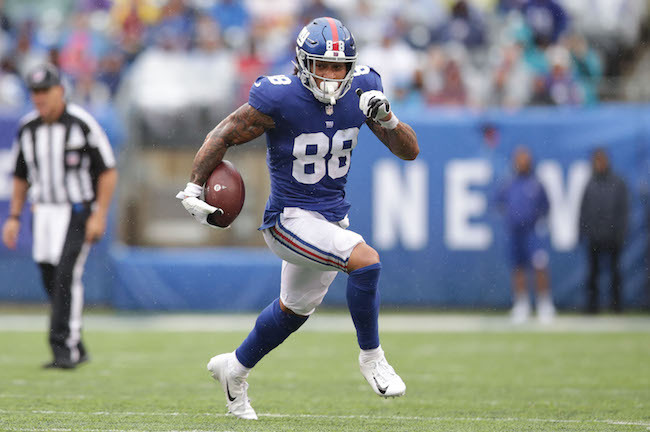 ADDITIONS/SUBTRACTIONS: The top three tight ends from last year – Evan Engram, Rhett Ellison, and Jerell Adams – all return. The Giants also retained late-season addition Ryan O’Malley. The newcomers are January waiver-wire pick-up Kyle Carter from the Vikings, ex-Raider and ex-Panther Scott Simonson, and rookie free agent Garrett Dickerson. Carter and Dickerson are built more like H-Backs than traditional in-line tight ends. TRAINING CAMP STORY LINES: While most of the eyes of the media and fans will be focused on Odell Beckham and Saquon Barkley, the development of Evan Engram will be one of the most important facets of the team to watch. One gets the sense that Engram just scratched the surface of his potential in 2017. On a terrible team with few weapons, Engram produced at a level that few rookie tight ends achieve. Now with hopefully better offensive coaching, a better offensive system, and a better supporting cast, Engram should be poised to become one of the more dangerous pass-receiving tight ends in the League. A couple of under-reported aspects from the offseason workouts were (1) Eli Manning’s favorite target appeared to be Engram, and (2) Engram didn’t drop passes. 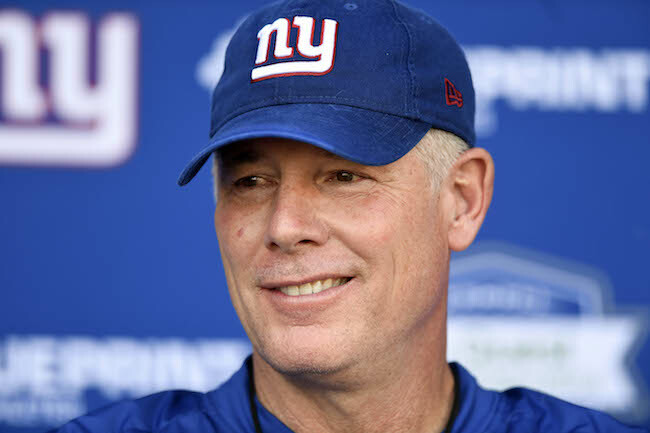 What will also be interesting to see will be how important the tight end position is in Pat Shurmur’s New York Giants offensive scheme. Most Giants fans know that Ben McAdoo was particularly wed to the three-wide receiver, one-back, one-tight end formation (or 11 personnel). Will Rhett Ellison, Jerell Adams, or others get a chance to see the field more in 2018? Also under-reported is that the Giants have a new tight ends coach. 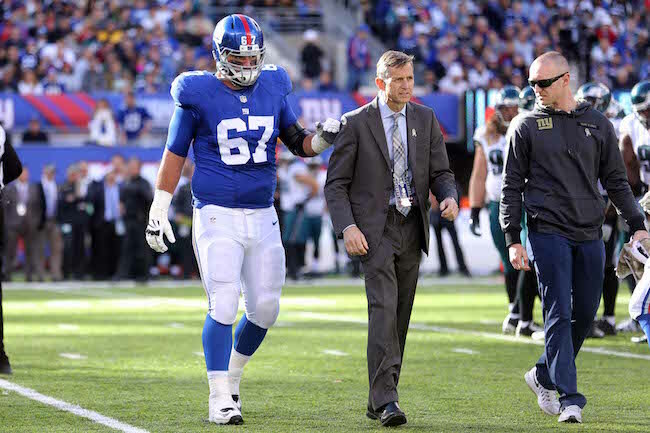 Lunda Wells was the assistant offensive line coach for the Giants under both Tom Coughlin and Ben McAdoo. He now shifts to a new position. 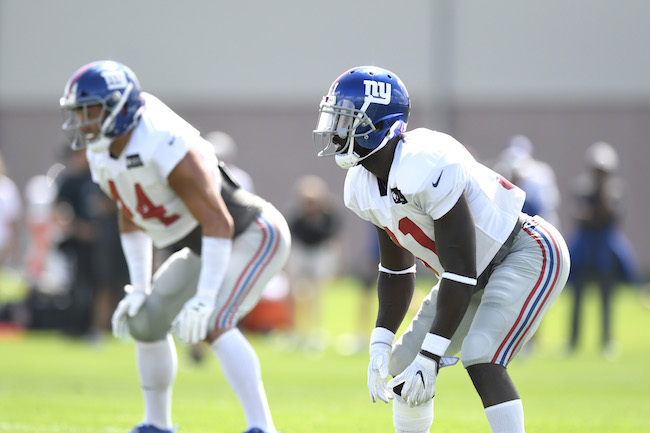 ON THE BUBBLE: Evan Engram and Rhett Ellison are locks to make the team. Jerell Adams probably has an upper hand, but the team did bring in some players – including an ex-Viking who worked with Pat Shurmur in Minnesota – who could beat him out if he falters. At this point, it is impossible to know how important the tight end/H-Back position will be in terms of numbers of players kept on the roster. The role of fullback will be a factor too in whether or not the Giants keep three or four tight ends. PREDICTIONS: I think there is a good chance that Evan Engram once again leads the team in catches and touchdown receptions. I think he will also break the 1,000-yard mark in receiving yards. FINAL DEPTH CHART: The same three from last year – Evan Engram, Rhett Ellison, and Jerell Adams. The Giants could carry four tight ends which would help the chances of one of the other four players. The New York Giants have waived running back Paul Perkins with a non-football injury. The team says Perkins suffered a pectoral injury prior to the start of the team’s offseason strength and conditioning program. The injury required surgery. Perkins was drafted by the Giants in the 5th round of the 2016 NFL Draft. After a respectable rookie season, Perkins had a very disappointing sophomore season in 2017. Perkins saw both his playing time and productivity markedly decline. In 2016, Perkins played in 14 regular-season games with one start (regular-season finale). He also started the playoff game. Perkins finished the 2016 regular season with 112 carries for 456 yards (4.1 yards per carry) and 15 catches for 162 yards (10.8 yards per catch). In 2017, Perkins started the first four games, but then suffered a rib injury and lost his starting job to Orleans Darkwa. He played in 11 games and finished the year with 41 carries for 90 yards (2.2 yards per carry). He also caught eight passes for 46 yards.